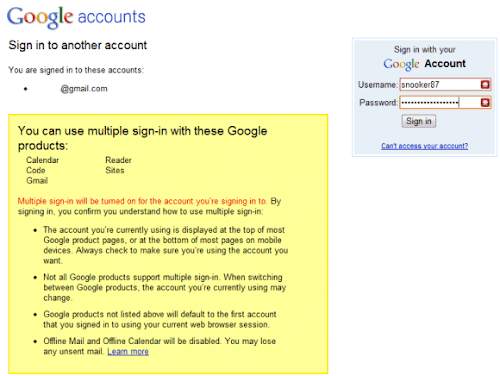 As I told before Google is soon launching a new feature by which you can sign-in to multiple Google account. So, now Google have launched thes feature. The feature by default comes off mode. 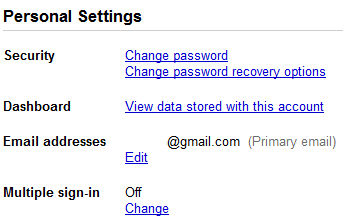 By going to your Google account page you will see in the Personal Settings options there is a new settings which is Multiple sign-in setting, (if it’s not there then it will be soon available) near the Multiple Sign-in setting you will see its written Change link, click on it. After clicking on the Change link you will be seeing Google is informing you that this is an advance feature and you can only use multiple sign-in to the following Google Product and Services. When multiple sign-in get enables you will see a Drop down button at the top-right beside your email ID, by which you can switch to your one account to another intently and add your other Google accounts. You can only add up to three Google accounts. The account which you use to sign-in to another account, the 1st account will become your default account. e.g. : you have 1st sign-in to the x1@gmail.com then using this ID you have signed in to the x2@gmail.com. So, the x1@gmail.com will become your default account. These are other some things you may need to know or you can take a help from Google Help Center. 1. If you use any product or services which don’t support this feature, you will automatically get into your default account for that product or service. 2. Is you once signed out from any account in any product you will automatically will signed out from all other accounts. 3. Enabling the multiple sign-in option will Disable your Offline products like Offline Gmail and Offline Calendar, as well as any browser bookmarks you’ve set to link to your accounts. 4. You can make it enable or disable any time by going to the multiple sign-in setting page. To add other accounts 1st enable the multiple sign-in setting. 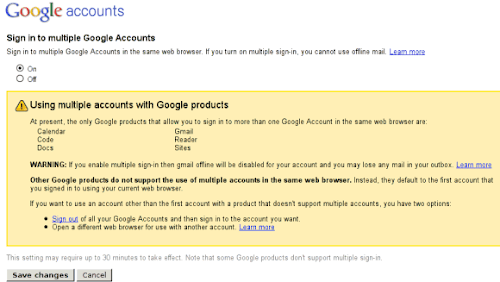 Once you have enabled the multiple sign-in for one of your Google account. Now here how you will able to add the other accounts to your 1st accounts. Go to the product or service which supports multiple sing-in and sing-in with your account which is enabled with multiple sign-in. Now you will see a drop down button beside your email ID at the top-right click on it. Select the ID you want to switch with or select the Sign-in to another account. Now entre your ID and password of which you want to access with and click on Sign In. 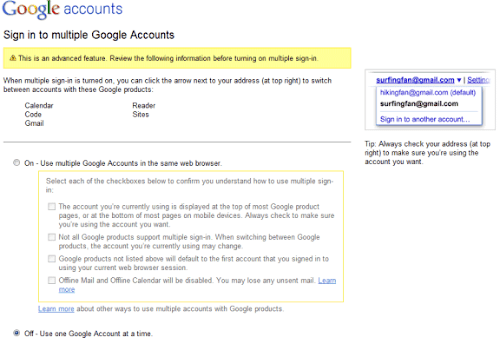 Do you maintain multiple Google Accounts on dally basis? And probably you wanted to login to your all the account at the same time. But at the time it is not possible to do with using the same browser (excluding Google Chrome) you need to use different browser for different login. 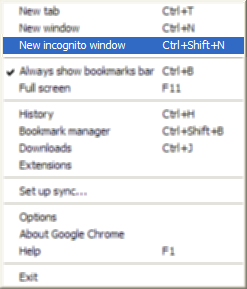 In chrome you can open 2 accounts at the same time using Chrome’s incognito window by going to the Customize and control Google Chrome (Settings) -> New incognito window (shortcut key: Ctrl+Shift+N). According to the Unofficial Google Operating System blog, Google is testing a new feature by which users can login to multiple Google account at same time by using same browser. This service is currently being tested on some of the Google service like Gmail, Google Calendar, Google Reader, Google Docs, Google Sites and Google Code, but it’s likely that other Google services will be added when this feature will be available publicly. One disadvantage of this feature is that when you turn on the multiple sign-in, you won’t be able to get access through offline mode till the multiple sign-in is on.